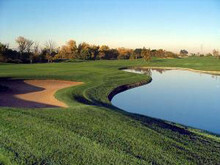 Los Lagos Golf Course is not a traditional par-72 course. The careful integration into the sensitive natural habitat surrounding Coyote Creek resulted in Los Lagos being a par-68 course with an emphasis on accurate design, quality layout and target-style golf. Designed by Brian Costello from the renowned JMP Golf Design Group, this course blends environmental preservation with sweeping grounds and a state-of-the-art facility. 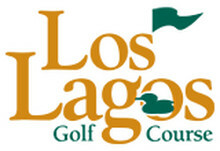 Since it's opening in 2002, the Los Lagos Golf Course has received multiple awards and recognition for the environmentally friendly and conservative practices. The low impact design scheme is also very economical; with rates as low as $36 on the weekdays and $49 on the weekends, this is one of the best bargains for golf in Silicon Valley. Anyone who is interested in enhancing their skills might just find the Los Lagos Learning & Performance Center to be the place they need. Instruction is available for all levels of players; available programs include private instruction, junior & group instruction, club fitting and specialty seminars. For golfers looking to improve their game, Los Lagos offers a lighted, two-tiered driving range with multiple distance marker open until 8:30pm (7:30pm on Thursdays). 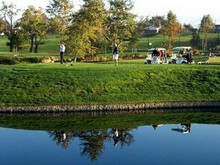 The Los Lagos Golf Course is an excellent setting for events and golf tournaments in San Jose. The flexible routes of play make it ideal for larger groups with golfers of varying levels, and the beautiful facilities—complete with a stylish restaurant and banquet space—allows for relaxation and socializing before and after the games. Anyone planning on hosting an event will find that the thorough staff will make all the preparations necessary for an expedient start and hassle-free experience, from reception areas for guests to pre-set golf carts to professional scoring. Los Lagos is a great place to host a corporate team building event. Let us help you organize an unforgettable experience for your group. Wide open fairways and greens at Los Lagos Golf Course in San Jose. Challenging golf links for expert and novice golfers.